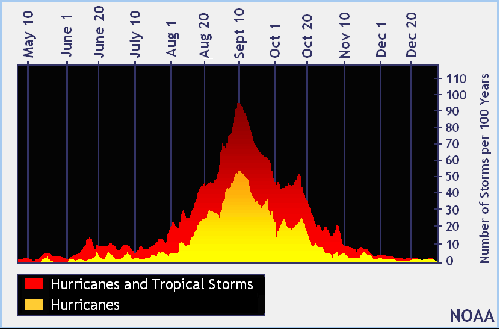 Hurricane season is considered to be in effect from June 1st through November 30th with a sharp peak in late August through September. As your partner, we feel it is vital to notify you of the preparations we have made and alternative processes that we will launch in order to support you during times of disaster; particularly in the event of a hurricane or storm that threatens either, or both of us. You can download “The Hurricane Action Plan Template” to help guide your institution to prepare for a disaster that may strike you. All critical services run from equipment in either the Tampa or Atlanta Co-Lo Data Centers. We have enough capacity at either site to run all our critical services. Replication of all critical servers has been configured between the two Datacenters. Domain Controllers are located at all sites. Servers can be failed over to an alternative location at a moments notice. Preparation. For any incoming storm or hurricane that directly impacts DataComm Networks Inc., we will maintain normal operations at the Tampa Bay headquarters as long as possible. We will contact you via email if our Disaster Recovery/Business Continuity Plan has been activated. We will send staff out ahead of the threatening storm to continue operations in the event of long-term power outages, data circuit disruptions, or catastrophic facility damage. We will determine the status of the Tampa site when a hurricane warning is issued and may initiate movement of services to the Atlanta colocation site to facilitate a recovery there. Communications. We will attempt to keep normal communications available to you including the phone and email options: 877-544-3655, 813-873-0674 or helpdesk@datacomm.com. We will contact you via email if our Disaster Recovery/Business Continuity Plan has been activated for a particular Tropical Cyclone, Storm, or Hurricane. or a storm surge exists over 9 feet above normal tide. 7 Days Out… Threat identified Our ISO & COO will make the decision to enact the Hurricane Action Plan (as part of our Business Continuity Plan/ Disaster Recovery Plan). Our HR team will collect critical emergency information from employees including contact information, evacuation plans, and modes of travel. Our Facilities Manager will verify and procure supplies for securing the sites. Our Project Management team will review active projects and communicate possible extensions to clients, staff, and management. The Project Management team will meet with Procurement and will ship out hardware as appropriate. Our Project Management Team, Purchasing, and Accounting teams will meet to close open projects, process orders, and batch invoices in a timely manner. Our Operations team will ensure staff is ready for Remote Access. Our Network Administrator will review plans to reroute network traffic, telephony traffic, VPN access, video conferencing, internal communications, and client services. 6 Days Out… Time to coordinate Facilities will provide staff with a hurricane supply list. Our HR team will provide a report for our COO which outlines staff plans regarding their evacuation date, evacuation destination, and the phone number of the destination. We will conduct a meeting with the DR/BCP Team and other Key Personnel to review the information gathered when the threat was identified and answer any questions and concerns. 5 Days Out… Time to prepare Our COO will release the first wave of staff to work remotely while securing their homes. Our Project Management Team will initiate adjustments to projects to improve workforce availability and will inform clients of possible shipping delays. Our Operations Coordinator will reserve accommodations for the 1st and 2nd wave of staff near our DR site. Our Marketing team will send email to clients possibly impacted by the storm and provide information that they may be able to use to better prepare their Institution for the storm. 4 Days Out… Time to Act Our COO will release the 2nd wave of staff to work remotely while securing their homes. Our ISO will update our President on current school and governmental entity closures. Our President will meet with the entire staff to discuss the threatening storm and we will authorize a statement to our clients. 3 Days Out… Time to Act Our COO will send the first wave of staff to our DR site. DataComm will distribute a notice to our clients that we are evacuating the Tampa site. Our Network Administrator will validate network failover is in place and manages the graceful shutdown and proper storage of IT Infrastructure at our Headquarters. Our Senior Systems Engineer will validate Client Backups at our DR site. 2 Days Out… Time to execute Our COO will send the 2nd wave staff to the DR site. All other staff will be released by their immediate supervisor to secure their homes & evacuate if necessary. Our Facilities Manager, Project Manager & COO will lock down our Tampa Headquarters in preparation for the storm. Our doors and windows will be reinforced, generators at the ready, circuit breakers turned off to all non-necessary equipment, computers and hardware will be raised above ground level and wrapped in visqueen, and the site will be cleared and secured. 1 Day Out… Time to Wait The first and second wave of staff will be monitoring from the DR site and escalating issues as needed. Our staff will report to HR their status, contact information, and location. All other staff will be assisting operations if available. Our CEO and COO will perform ad visit to our Tampa Headquarters to assess any changes. Our COO and IT Manager will make the decision to transition to DR site from Tampa Headquarters. Day of Storm…Time to Pray The first and second wave of staff will be monitoring from the DR site and escalating issues as needed. Our staff will report to HR their status, changes to contact information, and location. All other staff will be assisting operations if available. Day After storm… Time to Evaluate The first and second wave of staff will be continuing to monitor from the DR site as needed. Our staff will report to HR their status, contact information, and location and will indicate the best estimated time of return to the area and when they are available for remote work. All other staff will be assisting if available. Our CEO, COO or Facilities Manager will perform a visit to Tampa Headquarters and will report to HR if the site is suitable for resuming standard operations. Our IT Manager will evaluate IT infrastructure for either re-initiation of operations at the primary site or for continuing operations out of the DR site. 2 Days After storm… Time to Evaluate The first and second wave of staff will be continuing to monitor from the DR site as needed. Our staff will report to HR their status, contact information, and location and will indicate the best estimate time of return to Tampa Headquarters. All Staff will begin to return to our Tampa Headquarters if possible and resume normal operations. DataComm Networks Inc. will release a statement to all clients that we are back to being fully operational at out Tampa Headquarters. Projected Restart. If the Projected Restart date and time changes, please let us know as soon as possible. Our objectives as a critical partner of your institution are to continue provide managed services to you, to accommodate your requests to the best of our ability, and to restore all other services within 24 to 48 hours in the event of a disaster. We will attempt to keep normal communications with your institution via phone and email. Note, that service status and response times may change if your institution is in a state of emergency. Additionally, there are institutions around you that may also be impacted by a disaster. Therefore, communications and response times for your services will depend on priority, urgency, and staff availability. We appreciate your patience with us as we service those that have been most impacted by the latest storm. We have provided resources below for you to take action before, during, and after the storm. Test your emergency numbers for your critical vendors, contractors, or individuals. Verify your UPS or generator availability and functionality. Sign up for NWS’s Wireless Emergency Alerts and your community’s warning system to stay informed on the probability of your institution being impacted. The Emergency Alert System (EAS) and National Oceanic and Atmospheric Administration (NOAA) Weather Radio also provide emergency alerts. Visit the NWS’s Active Alerts: for theLatest Warnings, for your Warnings by State and for latest Hurricane information. Backup and secure data files. Take off-site where applicable. Gracefully shutdown servers, computers, and electrical devices. Get equipment up off the floor. Move equipment away from exterior walls and windows. Cover equipment (unplugged) for protection. Notify key persons of your plan of action and whereabouts (regulators, supervisors, family members). We are hopeful your families and coworkers stay safe throughout this Hurricane Season. If you have questions or concerns regarding the preparedness for a particular cyclone/storm, or need assistance after a storm, please do not hesitate to contact. Our disaster event action plan has been reviewed to ensure the resiliency of our critical managed services. Utilize The National Weather Center (here) and the National Hurricane Center (here) for Hurricane preparedness and the ‘Current Forecast Information’ (here) (NWS). Check on elderly relatives to ensure that they are prepared. Let your work contacts know that you are evacuating and how you can be reached. Keep in contact with your supervisor from time to time for updates. Maintain a list of emergency services contact numbers: especially hospitals, utilities, your local emergency management office, law enforcement and your property insurance agent. Leave when instructed to evacuate (remember Irma). Don’t wait until the roads are congested.